I want to buy an electric bike, where do I start? Aside from aesthetic preferences, how and where you will use your electric bike needs careful thought. That checklist will include the distances you’re likely to want – or need – to travel, the terrain, how fit you are and how much you would realistically enjoy in terms of journey time. The terrain is particularly important because if you live in a hilly area then many of us know what it feels like to have to get off half way up and walk to the top! Being defeated by a hill stops the day you get an electric bike. Furthermore, if some assistance is going to make the journey more enjoyable – and mean you’re more likely to stick to cycling than get back in the car having given up after a week – then an electric bike sounds just what you need. The market has evolved markedly over recent years. Frame style choices, folding e-bikes, e-MTBs, electric cargo bikes and trikes, battery options, motor positions and brands – a wide array of choices now exists to suit most people. It’s also worth considering the bike’s weight if you’ll need to carry it at any point. Pedelecs has a number of guides to talk you through researching your options. In our Buyers’ Guides section you’ll find ‘How to choose the right electric bike’ which should give you enough of an overview to get you started. That section also contains guides on electric bike law, how much you can expect to pay for an electric bike and running costs and overviews on batteries, motors, electric bike range and plenty more besides. There are also some very knowledgeable and friendly people willing to share their experiences on the forum. Just tell them where you’re at in your research and what you’re looking for ideas on if you think other peoples’ experiences will assist you in narrowing down your own shopping list. Once you have a shortlist, there is nothing better than test riding these e-bikes to see if your thoughts on paper work out in reality. 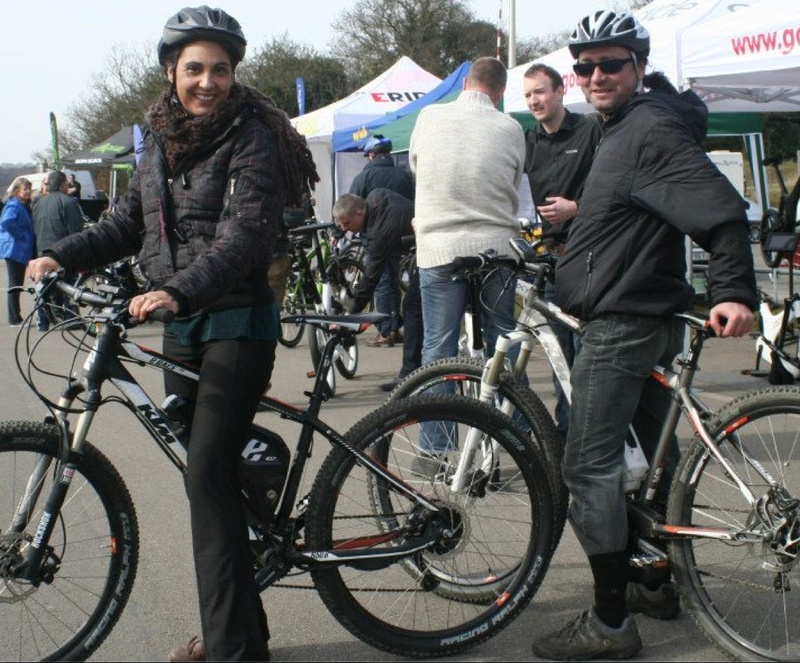 The NEC Cycle Show in Birmingham is a yearly event where you can see and test a multitude of electric bike brands on the e-bike test track. You can also use our e-bike dealer search to see which retailers are near you and our e-bike search tool is a really useful way of narrowing down the style of bike you’re after, coupled with your budget. You’ll also find dealers on our forum who will be more than happy to help. Converts to e-biking will always tell you ‘you’re hooked once you try one’ – there really is nothing better than actually getting in the saddle to understand how they can help you. Being able to select the level of assistance the motor provides to your own pedaling power has enabled some of our community members to avoid rush hour gridlock by taking a scenic cycling route to work, overcome type 2 diabetes and keep up with fitter cyclists on rides – as just a few examples. Those that choose an e-bike to ramp up a more active lifestyle find they are able to reduce the motor’s assistance as their fitness levels improve. All say that their e-bikes allow them to enjoy the fresh air and scenery around them in a way that just doesn’t happen when traveling by car or on the bus. A case in point was a BUPA survey with its employees back in 2012. The company loaned electric bikes to 40 of its staff for a period of at least 6 weeks. The result was that 70% of people said they would cycle more if they had an electric bike. The survey confirms what those with an e-bike already know, that electric bikes open up more cycling options for many: the everyday cyclist that needs to travel longer distances or wants to go further in the same time, those that want to get fitter using an e-bike and those using an e-bike for rehabilitation are just some examples.